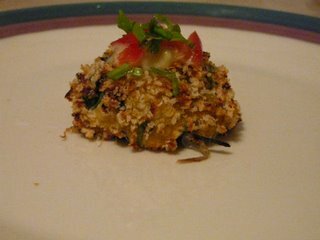 I don't feel like typing out the recipes today, but here are some pictures of two hors d'oeuvres I made. I) Mini sweet potato corn fritters, with mango salsa, and lime zest. The recipe is pretty straightforward. Grate some ~ 1.5 cups sweet potatoes, add in 1 Tbsp of corn flour, 1-2 eggs, diced scallions, salt and pepper to taste. Fry them to make mini pancakes. For the salsa, dice up mango, avocado, and purple onions. 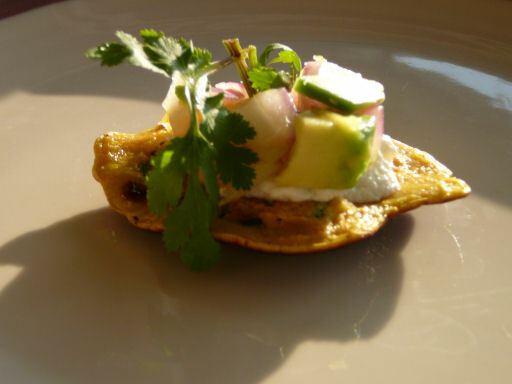 Lay down a bit of sour cream, top with salsa, lime zest, and garnish with a cilantro sprig. Essentially the same recipe as before (check my recipes in the summer), but with a bit of a Christmas touch. The other difference is that the crab cakes were baked rather than sauteed. I personally prefer sautee-ing, as it brings out more flavor, but baking is more convenient. The garnish is composed of a few julienned tomatoes (remove the pulp first), and diced cilantro. Yes, I love cilantro!